What causes claw toes / hammer toes / mallet toes? What causes claw toes / hammer toes / mallet toes ? Overuse of the Tibial group of muscles (these that run from the length of the shin bone to the inside of the arch of the foot) in a foot that rolls in too far. This can result in the long toe muscles on the front of the ankle and the top of the foot working hard to help the Tibial muscles to do their job. A secondary effect of this muscle activity is clawing of the toes. Precisely the same reason as above, where the Tibial muscles are weak for some reason, rather than having an excessive amount of work to do. Shoes that are too short for you can make your toes bunch up for obvious reasons. Shoes that are too loose around your instep are one of the most common causes of clawing. This happens because retracting the toes will make your foot thicker through to ball of the foot so that it will fill out the shoe better. Any disorder causing weakness in muscles can affect the toes. This would be primarily Strokes but other neurological disorders may have the same effect. 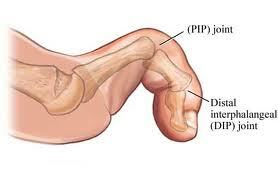 A large bunion moving into the space of the 2nd toe may displace the smaller toe upwards. Rheumatoid Arthritis can make toes and fingers quite unstable..
A diabetic disease process called glycosylation can make the collagen in the soft tissues of the foot (and elsewhere) tighten. To view this Q&A group about clawed toes as a single document in downloadable / printable format, please browse to our Claw Toes Info Sheet. Alternately, use this link to return to the Podiatry FAQs Blog.